Place the salt, pepper, and pink salt in a mixing bowl and mix well. Place the pork belly on a rimmed baking sheet. Coat and rub the pork well on all sides. Place the belly (plus any excess cure) in a large, sturdy, resealable plastic bag and refrigerate. Cure the belly for 5 days, flipping each day to keep the liquid distributed. Remove from bags and rinse well with cold water. Blot it dry with paper towels. Place the belly on a wire rack over a rimmed baking sheet in the refrigerator for at least 4 hours, or as long as overnight. Preheat your smoker to 175-225, add your choice of wood, I like hickory. Lay the pork belly directly on the grill grate. Smoke the pork belly until bronzed with wood smoke and firm, 2 to 3 hours and the temp hits 150 degrees F on the ends. 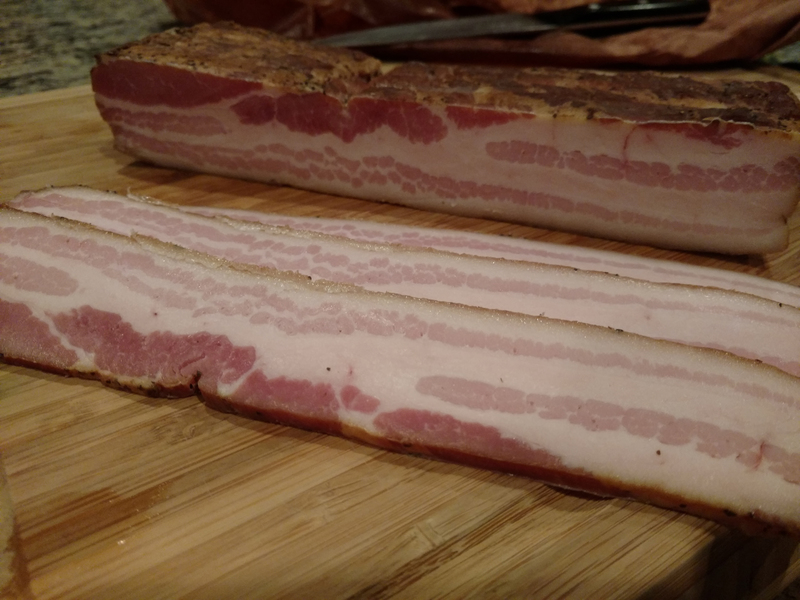 Transfer the bacon to a wire rack over a baking sheet and let it cool to room temperature. Tightly wrap it in plastic wrap and refrigerate for at least 4 hours, ideally overnight. Slice and cook (grill, panfry, or bake in the oven) and serve. If baking in the oven (recommended) bake at 400 without pre-heating for 25-28 minutes.